Ixia lies on the northern side of the island about 5 miles from the airport. The resort is home to an assortment of accommodation however there is a large selection of very good quality luxury four and five star hotels. These hotels have some superb facilities and can provide board arrangements from Bed and Breakfast through to all-inclusive. If you prefer to sunbathe by the pool this resort could be a good choice for you however if you enjoy windsurfing the beach here is a favourite spot for windsurfers with two water sports centres renting boards and jet-skis. Ixia's beaches have a mixture of sand and pebbles. In the evenings much of the entertainment is restricted to the hotels but Ixia has a good selection of bars and tavernas to help pass the night away. There is a good variety of tourist shops, and some supermarkets, to cater for all your holiday needs however if you are a serious shopper you should take a trip into Rhodes Old Town and delight in haggling for bargains in the narrow, cobbled streets. Good buys are leather bags and sandals, rugs, gold and silver jewellery and ceramics. Visitors will appreciate the close proximity to ancient Ialysos, one of the most important archaeological sites on the island located on the hill of Filerimos. Here you can find the remains of the temple of Zeus and Athena Poliada, as well as the ruins of the Byzantine fortifications, the 14th century church of the Knights and the road to Golgothas (a 'path of cypress trees' with impressive shrines on both sides). 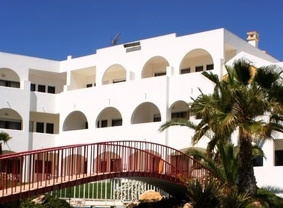 Ixia has good public transport links, buses and taxis are readily available throughout the resort. However, if you want to explore Rhodes further and the attractions further afield you may wish to consider renting a car. Please call us for a quote.